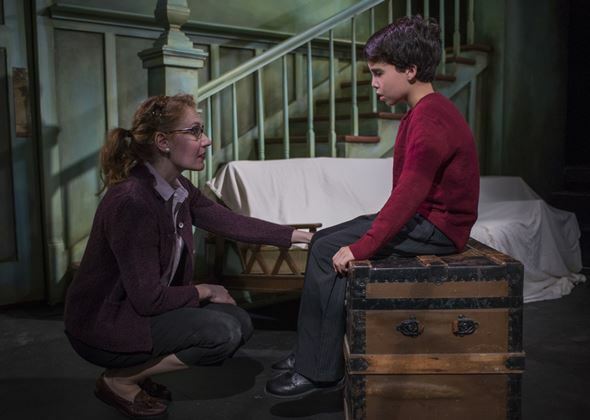 David Mamet’s eerie play “The Cryptogram” is the kind of stage experience that follows you home. 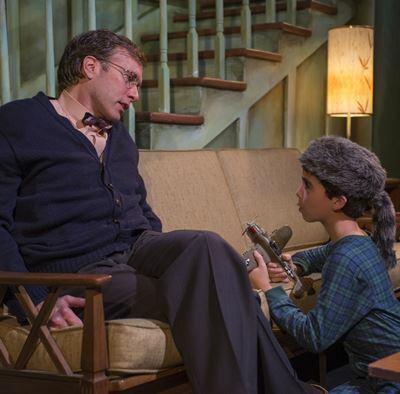 Certainly in the wake of a hyper-intense account at Profiles Theatre directed by Joe Jahraus, it continues to work on you, this concise, emotionally fraught and fractured tale of a little boy who’s so excited about a promised camping trip with his dad that he can’t sleep. For that matter, neither can his mother, or an old friend of the family who drops in. It has been said that language was invented to conceal the truth. The veracity of that proposition seems to be the bedrock of Mamet’s distinctive brand of fragmented dialogue – the thought half uttered, the question evasively repeated back to the questioner, the clash of syllables emitted all at once by several speakers. 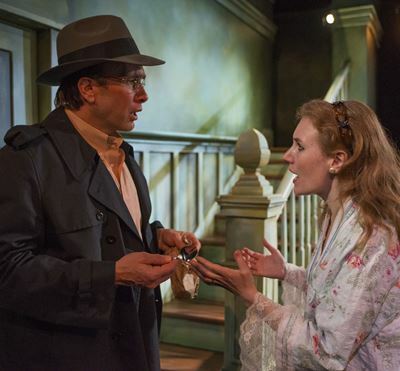 While “The Cryptogram” is indeed a paragon of Mamet’s piercing style, it’s also a remarkably subtle and elusive play that draws the viewer by skillfully and deceptively calculated degrees into a psychological vortex murky and scary. Part of the unfolding mystery is the nature of the terse communique of the play’s title. Is it the shocking, belatedly noticed letter left by the boy’s father? Or perhaps it’s an old photo of the boy’s mother with her husband and this guy now in her living room who curiously enough was wearing one of her husband’s shirts back then. And who exactly is the recipient anyway? 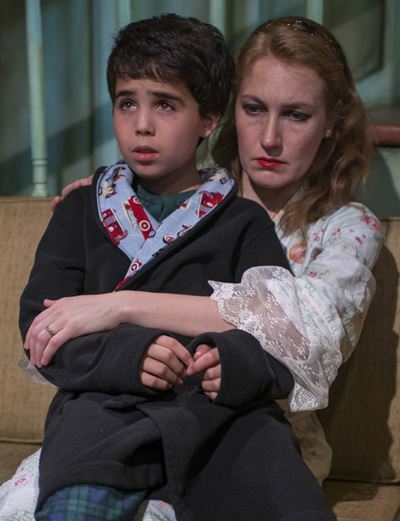 But all that would be unimportant to the eager, anxious boy John, played with impressive authority and vulnerability by Aaron Lamm, himself a seventh-grader. John just wants to know when his dad is coming home. They have a camping date. So he keeps pestering his mom Donny (Abigail Boucher) and their friend Del (Darrell W. Cox) about it. And minute by minute, in a real-time frame, Donny descends from impatience to anger at the whole ugly complexion of her life. Boucher offers a stark portrait of a woman rushing to the edge. Then there’s Cox’s soft-spoken Del, rational, reassuring, just a nice guy and good friend. In an effort to calm John – and get him to go to bed – Del quietly observes that even adults have trouble sleeping sometimes, like before a big trip. It’s the way people are, and the best thing would be to get some sleep. That exchange between Cox and Lamm is classic Mamet: Cox’s contained – even buttoned-up — Del speaking slowly and deliberately, Lamm’s wound-up John excitedly repeating what he hears, confirming that he gets it, offering his own illustrative examples. It’s like a two-part sonata in which the pianist is playing at a moderate tempo against a violinist improvising on themes at double the speed. And in spinning out Mamet’s intricate counterpoint, Lamm never misses a beat. But as the play modulates from that first expectant scene to one some days later, Del’s equable demeanor takes on a changed aspect. Here is Mamet the rhetorical pointillist dotting the page with muttered evasions as Donny begins to see links between the life now collapsing around her and knowledge perhaps shared between those good ol’ boys Del and her husband. Voices are raised, accusations shouted – by Donny anyway. Del mostly parries, and dithers. Quietly. But young John is in earshot. John, we now see clearly, is anxious by nature. And Donny has lived a lie. Children have a way of seeing through veils of deceit. They pick up the vibe. Once more John is flitting, hyper, demanding; only now Del can’t offer his whispered counsel. Del is busy backpedaling. John’s distress escalates. There’s a box in the attic he wants to open; he needs to cut the twine on it. Del has a knife that belonged to John’s father. John needs the knife. Mamet’s cryptogram may be writ in neither words nor images. But its dark message, its earthshattering message, is unquestionably telegraphed. And signed for.